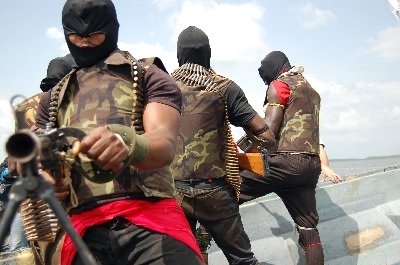 A coalition of nine militant groups in Niger Delta, the Reformed Niger Delta Avengers, has lashed out at the Peoples Democratic Party (PDP) for creating poverty in Niger Delta despite being in power for 16 years. According to The Nation, RNDA, in an electronic statement yesterday signed by ‘General’ Johnmark Ezonebi, lamented that the PDP was busy looting the treasury instead of developing the region. The RNDA regretted the wasted years of ex-President Goodluck Jonathan, accusing the Jonathan administration of corruption, looting, favouritism and non-supervision of his appointees. The group said no project was completed in Niger Delta during Jonathan’s era adding that the poor performance of Jonathan, who hails from Niger Delta, took the region back. The RNDA, however, hailed the Muhammadu Buhari-led All Progressives Congress (APC) towards development of the region. The militants said they carried out an appraisal of Buhari’s performance and concluded that the President deserved commendation. They warned some leaders of the region, who they described as enemies of Niger Delta, to stay off or have themselves to be blamed. “We accepted the Federal Government’s ceasefire agreement in 2016 for dialogue. That acceptance has led to the sustained peace in the region following renewed destruction and bombings of oil installations and facilities that crippled the nation’s crude oil output. “Most worrisome and painful is the fact that Buhari’s predecessor goofed on development of the region as he was unable to complete the road to his Otuoke community in Bayelsa State. “We praise Buhari’s commitment to Niger Delta since 2015 depite the recession as crude output hit as low as 900 barrels daily, with price as low as between $35 and $45 per barrel due to agitation in the creek’’. “Buhari’s fight against corruption has defined his stand on development of the region. We want to commend him for the btake off of academic activities of the Nigerian Maritime University, Okerenkoko, Delta State. Secret Romance: Is Tiwa Savage Dating Wizkid?